You probably do not believe, but it's true. Yes! Firdous has launched spring-summer addition with latest fashion trends and innovative designs philosophy. Firdous Cloth Mills has introduced a wide array of lawn dresses including shoulder-less shirts, mid sleeved shirts, sleeveless and full sleeves shirts, long shirts , gowns, maxis, frocks every thing in modern ways. Firdous Cloth Mill's spectacular new spring-summer lawn collection offer a wide variety of prestigious and seductive designs. These glittering creations are not only look fantastic but also attempt great accessories of embroidery, silk and laces. Bold and bright, brand-new, vivid and conspicuous colors are really makes your summer moment perfect. All the dresses which you can seen in this collection are printed with lawn dubattas. Firdous has adds imperial tones in every lawn dress. These exclusive prints perfect for your stylish summer occasions. The price range of this collection is so affordable which started from PKR 1520 to 1620. Trendy embroidered neckline suits with luxurious palazzos also added in this collection which is the trend today. 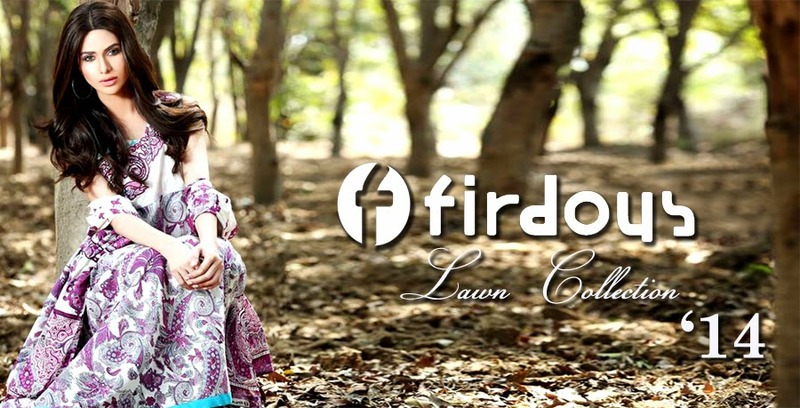 Let's have closer look on Firdous Lawn Collection 2014 March Catalogue.